The very first time I came across these delightfully flavourful, fragrant, spicy sandwiches was at my local Asian store in Houston. Unfortunately, I couldn’t try them back then because for one, I couldn’t communicate with the little old lady making them to ask her which ones, if any, didn’t have pork. All I know is that they looked so colourful and appetising as she handed them over to the person ordering, and I knew I had to research them so I knew what to ask (providing I could communicate with the person), next time I had the opportunity. I never did get to try one. After I researched the banh mi, I found out that most are based around meat, though there is an occasional vegetarian one and ones made for breakfast that have eggs, but they too have some sort of meat, usually pork, that I could not eat. Even the chicken ones usually have a pâté smeared inside and that puts it out of my reach. So, the only way to satisfy my craving for these wonderful morsels was to make them myself. They have been on my “to do” list for a good two or three years now! I just never got around to making them. I have been fortunate to live close to a fabulous Asian stores each time I’ve moved (4 times in 5 years). I have a great store close to me now with a big variety of Asian foods and delicacies available from bronzed, glistening ducks, smoked sausages and pastries to an array of fresh Asian vegetables that are so lush and fragrant but whose names I cannot pronounce nor read most of the time! What’s great about this store is the bakery; you are almost certain to be met with a heavenly aroma of baked goods as soon as you enter the store, drawing you towards the various kinds of freshly baked breads, pastries and cakes. Once again, I am at a loss with the signs. One of the things I can read and see clearly without translation, is their French baguettes, made specially for these banh mi. In Vietnamese, the banh mi refers to bread in general. The popularity of these sandwiches have now made the banh mi a label for sandwiches, not just bread. 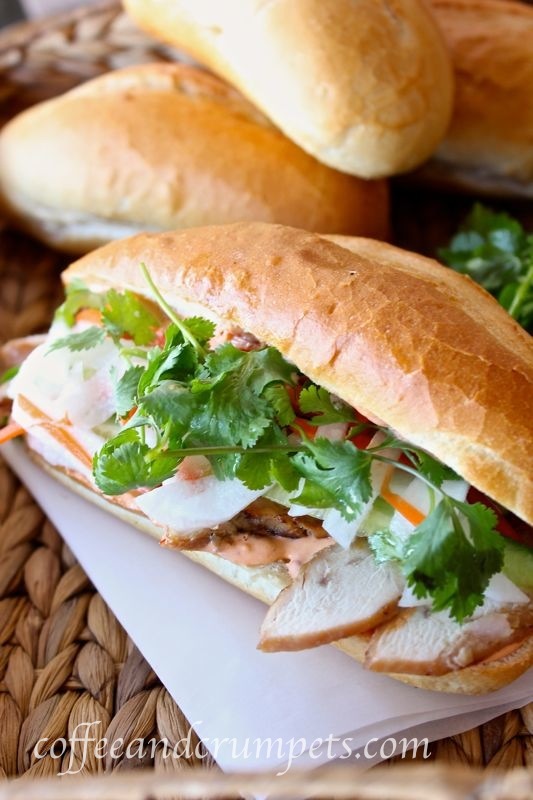 Sandwiches became popular in Vietnam during the French colonisation. The French colonised Vietnam in the middle of the 19th century until 1940 and influenced Vietnam’s food scene. The Vietnamese became experts in French pastries and breads. Some of the best pastries I had in Houston came from a Vietnamese baker, an acquaintance of my brother. The baguettes that are made for these banh mi are a little different from regular French baguettes in that these are very light and extra crispy. I believe they have some rice flour added to aid in the crispiness and airiness. The extra airy insides allows you to fill the sandwich to the brim with the goodies and still keep the bread crisp. If possible, seek out the Vietnamese baguettes but if that’s not possible, use small, individual, regular baguettes and pull out some of the insides to allow room for stuffing. I would make these which ever way you can! They are so good that you should not wait to find the right kind of bread just to make them. I mentioned above some of the varations you can find of banh mi, the vegetarian and breakfast one with eggs. Other popular ones are made with BBQ’d beef, pork or chicken, or ones smeared with pâté and filled with pickles and chillies; another popular banh mi is the one filled with meatballs. Cilantro, green chillies, pickled daikon and carrots are popular condiments to accompany the meat inside the sandwich, all tied together with a spicy mayonnaise. My recipe was adapted from Andrea Ngyuen. She has a wonderful blog,Viet World Kitchen and is the author of many great Vietnamese cook books. Whenever I need a Vietnamese recipe, I turn to her website. Make deep gashes on the chicken breasts. Mix the brown sugar, garlic, onion, lemongrass, soy sauce, and fish sauce together in a bowl. Add the chicken breasts and marinate for at least an hour. The chicken will start taking on a nice brown colour. Remove the chicken from the marinade and toss in the oil. Place on the hot grill and cook. Grill until golden brown on the outside and cooked through, about 20/30 minutes. In the oven, bake until cooked through and then broil until brown and slightly charred. Let cool before slicing for sandwiches. Use your hands to knead the vegetables for about 3 minutes and releasing the water. Stop kneading when the daikon is flexible but does not break when bent. Return the vegetables to the bowl if you plan to eat them soon, or transfer them to a 1-quart jar for longer storage. To make the brine, in a bowl, combine the ½ cup sugar, the vinegar, and the water and stir to dissolve the sugar. Pour over the vegetables allowing the brine to cover the vegetables completely. Let the vegetables marinate in the brine for at least 1 hour before eating. Slice open a baguette and smear liberally with spicy mayonnaise. Add slices of grilled chicken. Stuff with cucumber slices, carrot daikon pickles and cilantro or choice of herbs. If you have not tried these sandwiches, you do not know what you are missing! Find yourself a good Asian store or restaurant and buy them or make them. They are so easy. Start with my very easy and delicious Banh Mi Ga and go from there! Hope you are all having a great week and spring has inspired you to create! I’m very careful about what I am ordering at Vietnamese restaurant because of hidden pork in the ingredient so never tried these sandwiches. Thanks for the lovely recipe, my friend. Now I can make some and try. Thanks Charlie and you’re right! I don’t want to miss out!If something looks good but I can’t eat it..I try my hardest to find a way around it! That sandwich looks delicious and healthy. One question, could you clarify the amount of distilled white vinegar needed for the carrot and daikon pickle? Thanks. Hi Norma! Sorry about the measurement, it’s difficult trying to do fractions on this recipe card thingy…but it’s supposed to 1 and 1/4 cup of distilled vinegar. The daikon pickle is wonderful, I couldn’t stop eating just the pickle. Thanks Nazneen. I love pickle, saving this recipe for the fall when my daikon and carrots will be ready for harvesting. Wonderful Norma! Sure wish I lived closer to you! I love this sandwich! But it’s one I’ve never made myself – why is that, I wonder? Yours looks terrific, and I really should assemble the ingredients and make this at home – I’m sure it’d be habit forming. 😉 Good stuff – thanks. Thanks John! It’s so easy you must try it at home. Knowing you, you’ll come up with some fabulous filling. The first time I ever had this lovely sandwich was in Houston too!! There is no shortage of great Vietnamese places in Houston. I have eaten this before and I was in heaven the whole time! So you know! It’s wonderful isn’t it? I love this sandwiches…and yes, I like mine with lots of pickles and cilantro…yum! Thanks Juliana! I love mine with lots of pickles and cilantro too. Thanks for stopping by! Love the sandwiches in whichever mode, but really like your way of flavouring the chicken and with plenty of lemongrass growing in the garden ahall make some grilled thighs with a Vietnamese salad for tomorrow’s lunch. Thank you 🙂 ! Thanks Eha and lucky you! You have lemongrass growing! Thankfully, it’s not too pricey here so I can get some easily, but free in my garden would be better! Thanks for stopping by and leaving a comment! Mmmmm…Just looking at it makes me hungry.I have never had this sandwich but the ingredients really catch my attention. If you can find a gluten free roll, you must make these…they are so fresh and flavourful. I do know of a few Vietnamese restaurants, though, and should stop by to try their banh mi. So fresh and flavorful, they sound like the perfect lunchtime sandwich. Your comment made me laugh so hard John! It’s true, as much as I love perusing the aisles of that store, I am pretty much at a loss most of the time. I dare not even ask for help! I am now just going to learn Chinese, or Thai or Korean…or maybe all of them! Wow, those look fabulous! I keep hearing about an Asian store near you, but I haven’t quite found it yet; Is it Pacific Ocean? Hubby keeps asking me to hit H mart when we’re in Denver, but by then we’ve already hit four different stores for just our basic groceries. You know how it goes… I think I need to add an Asian place to our list, though, because every time I pick up lemongrass from King Soopers it’s moldy. I wonder if I can make Pho at home too? Hm. Yum. Thanks for posting. Can’t believe this weather we’re having. Just checked, yes, that site by Andrea is amazing and has Pho! Thanks for the link! Yep..it’s POM. Really close to me. We can go one day if you like. Wow!!! This looks amazing, Nazneen! I love sandwiches…Eating something so elaborated like this one is to go for it. Thanks Denise! San Antonio should have a few good Viet places and you can try one. That’s good to hear that you can get them there. Is there a big Viet community in the UK now? Oh, the pickle is wonderful! I think you’ll really like it and its so easy to make. I warn you though, it can get really stinky the longer it sits…just air it out and you’ll be fine. These sandwiches look out of the world Nazneen. The Asian twist makes it all the more special. I have quite a few Asian stores where I stay and I am very intrigued by the products on display. Most of the labels are not even in English but out of curiosity I keep trying them out. I have to admit though that never dissapoint..they are full of flavour and so aromatic. I can relate to your post and Lemongrass ranks very high amongst my favorite ingredients. Cant wait to try out the grilled chicken! Sugar et al recently posted..White chocolate and Macadamia Caramel Cookies. Thanks Sonali! It’s good to hear you’re like me! We are not easily defeated at the Asian market! Thanks Bobbi! The pickles were so good and the zippy may made a huge difference. The chicken was really good too and most def can stand on its own as a meal.